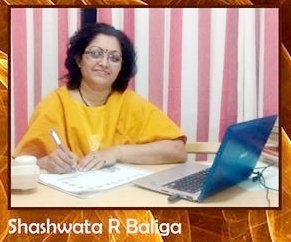 Shashwata.R.Baliga has a religious family background and been a student of Astrology since the age of twelve and is still actively researching, studying, and using Astrology. She is a voracious reader of astrology and has analyzed over a 1000 horoscopes since last 15 years and has advised the required solutions. She is also actively involved in palmistry. Hailing from a religious Brahman family, and having witnessed the death of her maternal grandmother at a young age of 12, She started the journey to search for soul, birth and death. Her search about heavenly bodies and secret science began from that day. In her opinion, Astrology is a study of planets in solar system. The movements of heavenly bodies do affect us sometimes positively and sometimes in a negative manner. She analyzes their contemporary movements and predicts the future happenings of life. She advises the correct solution (as per her knowledge and rich experience based on Vedic astrology), on beneficial remedies or suggesting remedial measures to get rid of negativity. She prescribes PRAYERS(puja), GIFT(daan) and STONE THERAPY(Ratna dhaaran) and precautionary measures as well. Besides all these remedies, the intensity, sincerity and regularity in remedial efforts of the native are also deciding factors for good results. A birth chart reveals the responsible planets (karak graha) which makes education beneficial. According to her view, besides “GUNN”(Character) matching, certain others factors also need to be considered for better marriage prospects. She looks at other factors at microscopic level such as life span, Luck, fertility and financial status while matching two horoscopes for marriage. As an astrologer, She tries her level best to analyze horoscopes, find out the solution to a problem and advice vedic remedial measures. Rest of the native’s fortune lies on “the native’s “good deeds (SHUBHA KARMA). Both the idea of creating this web site and its name were conceived and planned, designed and launched at a good auspicious time for starting anything new. Shashwata’s goal is to maintain a site for anyone interested in Astrology and impart her knowledge, whether that interest is a casual or compelling one. The content in the website are the result of years of study, application, and research. The ‘Ask Shashwata‘s column is set up for those who have burning questions about their lives. Shashwata’s answers are written from an astrological perspective. She aims to help bring enlightenment to some of life’s problems, using Astrology techniques as tools for making sense of life.